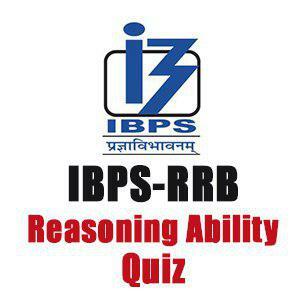 Mahendra Guru September 01, 2018 Important Reasoning Questions For IBPS RRB PO/Clerk, Reasoning Ability For IBPS RRB Clerk/PO, reasoning questions. Q.1-5. Study the following information carefully and answer the questions given below. Eight friends W, D, H, K, J, M, L, and O are sitting around a circular table and facing outside of the centre but not necessarily in the same order. Except one, all other friends have taken a medicine on any one day of a week from Monday to Sunday. H, who takes medicine on Wednesday, sits second to the left of W.
K takes medicine on Friday and he is third to the right of M who is the neighbour of W.
The one who takes medicine on Saturday is in front of W and he is not the neighbour of K and J.
O takes medicine on Sunday. The one who takes medicine on Monday is not the neighbour of K.
D, who takes medicine on Tuesday, is fourth to the right of J. The common neighbour of both K and W does not take any medicine. Q.1. Who take medicine on Monday? सोमवार को दवा कौन लेता है? Q.2. Which of the following is true regarding H? (1) H is third to the left of L.
(2) H takes medicine on Sunday. (3) H is immediate to the left of O. (4) H is infront of K.
(5) H takes medicine on Thursday. H के संदर्भ में क्या सत्य है? Q.3. Who is fifth to the left of that friend who takes medicine on Saturday? उस दोस्त के बायें पांचवां कौन है, जो शनिवार को दवा लेता है? Q.4. Four of the following five are alike in a certain way and so form a group. Which one of the following does not belong to that group? निम्न पांच में से चार एक निश्चित तरीके से समान हैं और इसलिए एक समूह बनाते हैं। निम्न में से कौन-सा उस समूह से संबंधित नहीं है? Q.5. Which of the following friends does not take any medicine? निम्नलिखित दोस्तों में से किसके द्वारा कोई दवा नहीं ली जाती है? Q.6-10. Study the following information carefully and answer the questions given below. Seven persons Queen, Puneet, Manoj, Yahiya, Eram, Charu, and Shara are traveling in the seven compartments of a train, with their only little child i.e. 23, 17, 15, 16, 11, 44 and 12 but not necessarily in the same order. Queen travels with their child 11 in the fourth compartment. The one who has their child 15, does not travel in the fifth and second compartments. 17 is the child of Yahiya and they both do not travel in the second and sixth compartments. 23 and 16 are not a child of Puneet and Charu and they both travel with that person who travels in the first and third compartments respectively. 44 and 12 are the child of Charu and Eram respectively. Manoj who does not travel in the third compartment. Eram travels in the fifth compartment. Q.6. Who travels in the seventh compartment? सातवें डिब्बे में कौन यात्रा करता है? Q.7. 23 is a child of which one? Q.7. What is definitely true regarding child 16? (1) 16 is child of Eram. (2) 16 travels in the fifth compartment. (3) 16 is child of Shara. (4) 16 travels in the sixth compartment. (5) Other than these options. बच्चे 16 के सन्दर्भ में निश्चित रूप से क्या सत्य है? निम्नलिखित पांच में से चार एक निश्चित तरीके से एक समान है और इसलिए एक समूह बनाते है। निम्न में से कौन सा एक उस समूह से सम्बधिंत नहीं है? Q.10. Who travels in the sixth compartment? छठे डिब्बे में कौन यात्रा करता है?